May 17, 2013: AAVSO assistance has been requested by Dr. Juan Echevarria (Universidad Nacional Autónoma de México) and colleagues in a campaign on the Z Cam-type cataclysmic variable AH Her being carried out 2013 May 29 - June 18. They will be making photometric and spectroscopic observations of AH Her using the 2.1m and 0.84m telescopes at San Pedro Martir Observatory (SPM). Their goal is to carry out a radial velocity study of the system components using modern detectors; no study of AH Her has been made since the one by Horne, Wade, and Szkody in 1980-1981 (1986MNRAS.219..791H). Photometry and spectroscopy are requested. It is essential to pinpoint the minimum of AH Her for the radial velocity study to be most successful. Since the SPM photometry will not be reduced in real-time, AAVSO observations, reported in a timely manner, will be crucial to determining the time of minimum and so to the success of the campaign. AH Her, for decades a reasonably "regular" Z Cam system, began exhibiting significantly anomalous behavior in ~2007. Since then it has experienced brief periods of fairly typical behavior interspersed with more anomalous intervals, including some unprecedented behavior. Most recently, it has returned to a more normal pattern of outbursts shape-wise but it is not back to its normal amplitude or frequency. In light of this behavior, your observations are even more crucial. Sample light curves of AH Her from the AAVSO International Database (AID) may be viewed below ("normal" behavior in 1985, anomalous behavior 2006-2013, and recent behavior Sep 2012 - May 2013). AH Her can be as bright as 10.8V at maximum and as faint as 14.7V at minimum. Most recently it has been varying between ~11.8V and 14.3V, after emerging from a standstill. Currently AH Her is near minimum at 14.0V. Beginning now through the end of June 2013, V observations of AH Her are requested. When the system is in outburst, nightly observations are sufficient. As the system declines, and during minimum, multiple observations per night are requested in order to determine precisely the minimum behavior and the time of minimum. Positive visual observations are also welcome. Spectroscopy is also requested, if possible, 2013 May 29 through June 18. Dr. Echevarria requests spectroscopists to focus on the strongest Balmer line - Halpha or Hbeta. 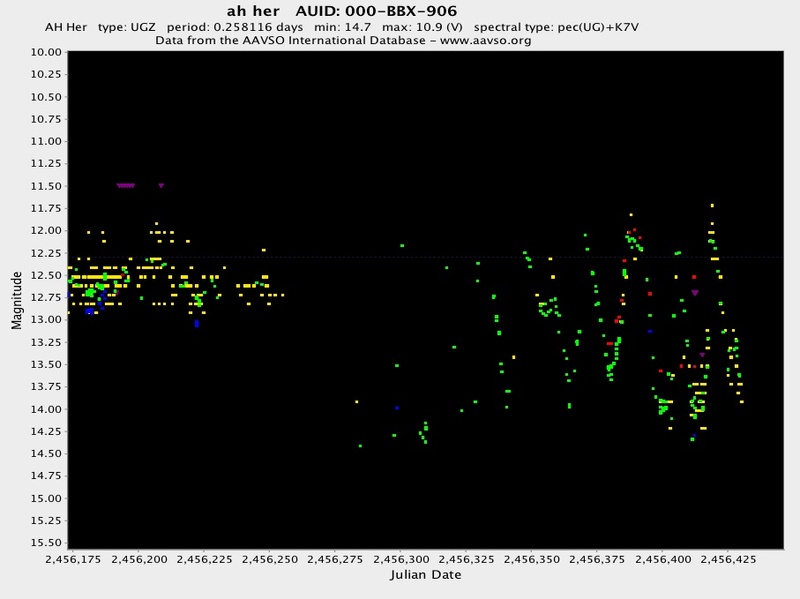 He will know within a few hours of beginning the echelle spectrum observations on May 29 which line would be the best to cover, and we will let observers know as quickly as possible. Transmitting the observations to the astronomers quickly will be imperative, so please submit your observations to the AID immediately or as soon as possible after making them, and use the name AH HER. 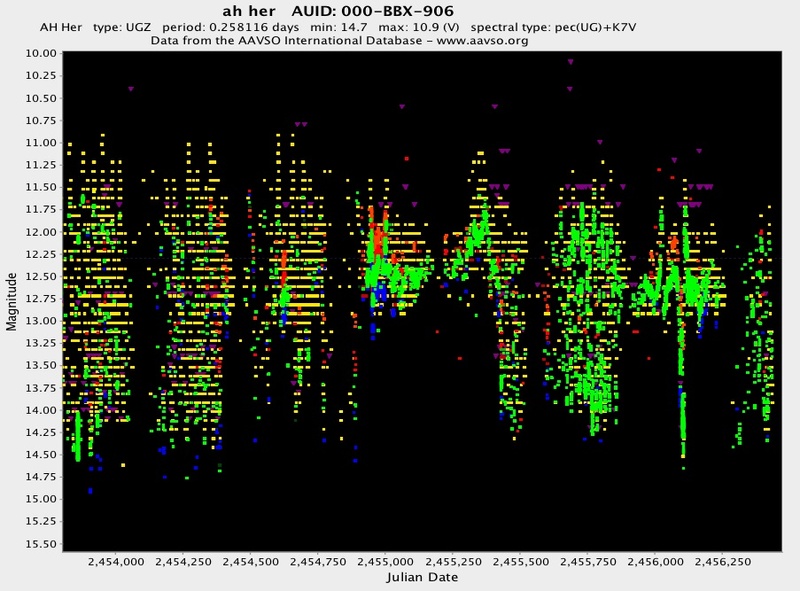 Charts for AH Her may be created using the AAVSO International Variable Star Plotter (http://www.aavso.org/vsp).